To try a fresh fig, if you haven’t ever. It’s not too late to add a bit of figs to your order! 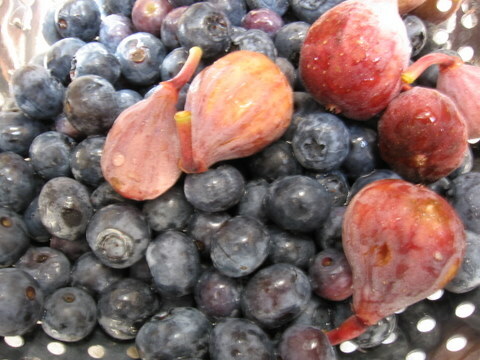 Fig season is at the top of my list in terms of produce–there’s a three-way tie for me between peach season, blueberry season, and fig season. It’s difficult because they all overlap!! There is a lot of fruit consumption that needs to happen in a short amount of time. Fresh figs are NOTHING like what you taste in a fig newton cookie. I don’t enjoy those very much. I do enjoy fresh figs. They do not have a long shelf-life, even in the refrigerator–a few days after picking is their limit. I imagine that’s why they aren’t often found in grocery stores. But once you taste a fig, having to consume them quickly will not be an issue. They are one of the first cultivated plants. They have a lot of calcium! 3.5 oz = 16% of the RDV of calcium! Figs aren’t actually a fruit–they are the plant’s flower. Amazing, no? Figs are an excellent laxative. There are tons of ways to eat figs. They are delicious when paired with a bit of cheese, such as brie or goat cheese. 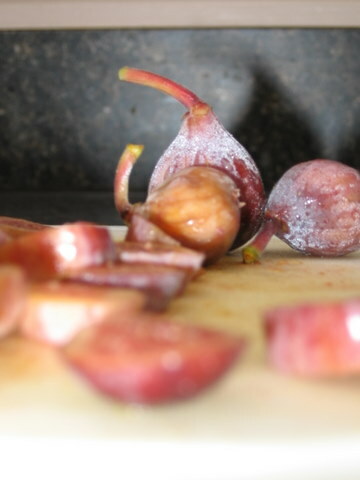 There are many summer recipes that include the use of figs. I prefer to just eat them. It’s very simple–just hold the stem and if it’s small enough, pop the whole thing into your mouth and bite it off just before the stem. 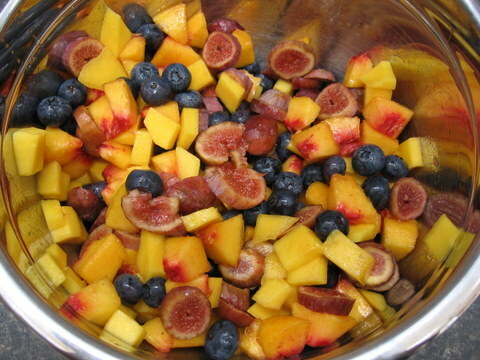 Today I simply added what I had left to a fruit salad that we ate for breakfast (see below). So! Try some figs! And if you hate them…I am happy to pick up your leftovers from your house 🙂 But I don’t think you’ll be disappointed! Aren't these two fruits beautiful together? The figs we have locally are usually purple/red/greenish and are smaller than Mediterranean figs, but no less delicious.